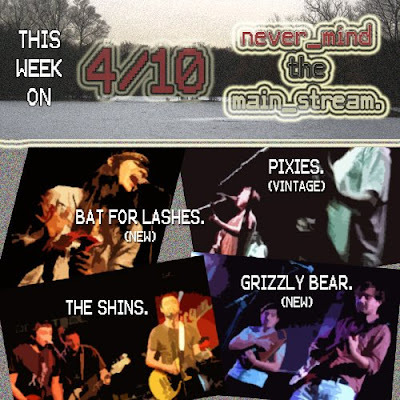 Never Mind The Mainstream on KUR (College Rock Radio): A Very "Good Friday" Show On The Way! A Very "Good Friday" Show On The Way! Every school, workplace, and government job should be off for Good Friday, right? It's the Lord's day to party. But guess what - we're still rocking the revolution here on Never Mind! Check out that poster: we got so many new tunes this week, it's madness, ranging from Bat For Lashes to Grizzly Bear; and also, but not feautured in my artwork: Bon Iver, The Hold Steady, k-os, Ra Ra Riot, and Takka Takka. Roots tunes include the epic loud-quiet-loud foundation planted by the Pixies, the bible-meets-80's clash proclaimed by Peter Gabriel, and the down-unda heat provided by Midnight Oil. A very, VERY good show hits KUR Friday, 6-8 PM, streaming @ kur.kutztown.edu. Call in @ (610)-683-4058 or IM us @ KURRequest. Lent is over - rejoyce! Jim and myself are here to be the saviors of alternative and inide rock! Ye (Yay).